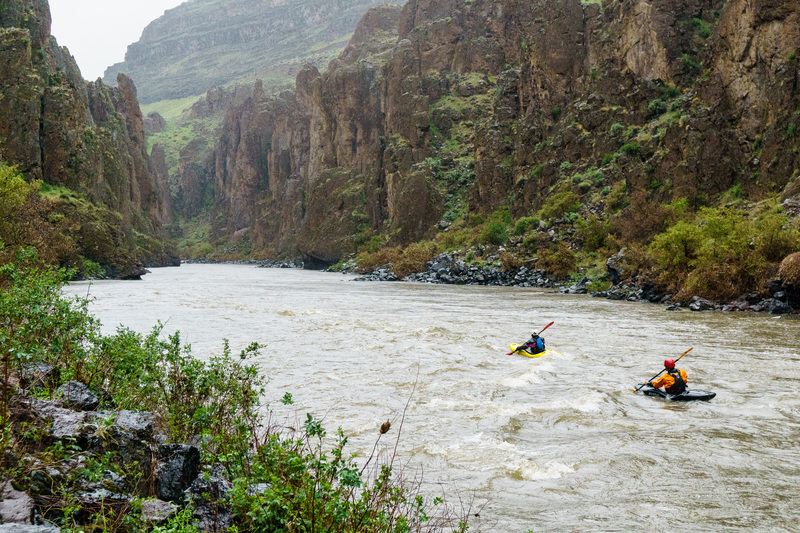 The Middle Owyhee from Three Forks to Rome is an incredible float through rarely visited other-worldly canyons just a couple hours from Boise. Great camping, spectacular scenery, and excellent class III-IV whitewater (with one portageable V) make this one of my favorite shorter trips. 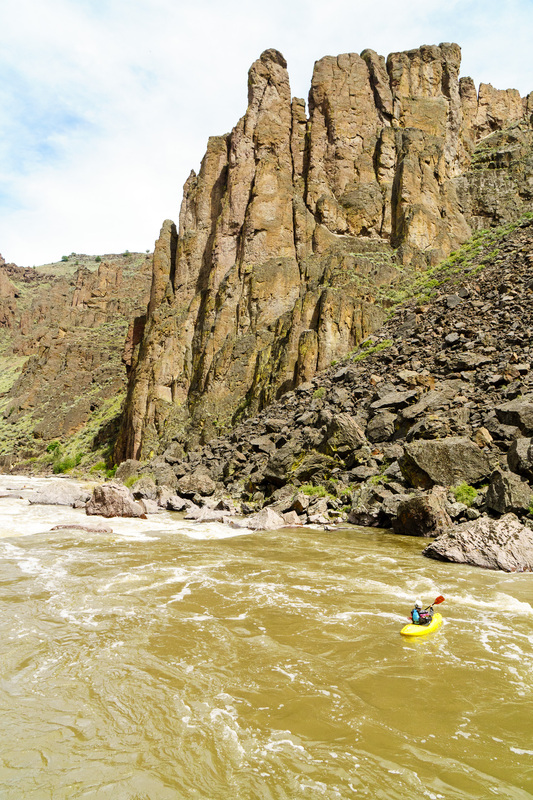 Beautiful canyons below Widowmaker on the Middle Owyhee. There are no permits and your odds of seeing a ranger on this section are near zero, but the BLM does (with good reason) require some gear for private boaters. You are also required to register at the bulletin board at Three Forks before launching. Daphnee Tuzlak drops in to the first rapid through the other-worldly terrain of the Middle Owyhee. The shuttle on the Owyhee isn’t too long, mileage wise, but remember you’ll have to drive these dirt roads twice if you set your own. The longer route isn’t terrible, but it’s not good either. I believe the shorter route is a bit rougher. Bear in mind, too, that if it rains, these roads can become impassable, which could strand you if you were planning to pick up a car after your run. If you’d like to pay for shuttle, there are a few options. Eva Matteri has been highly recommended, and I’ve seen some mixed reports online about the Hayletts. The river is way out there, so don’t necessarily expect to be able to book last minute — try to call ahead by at least a few days. 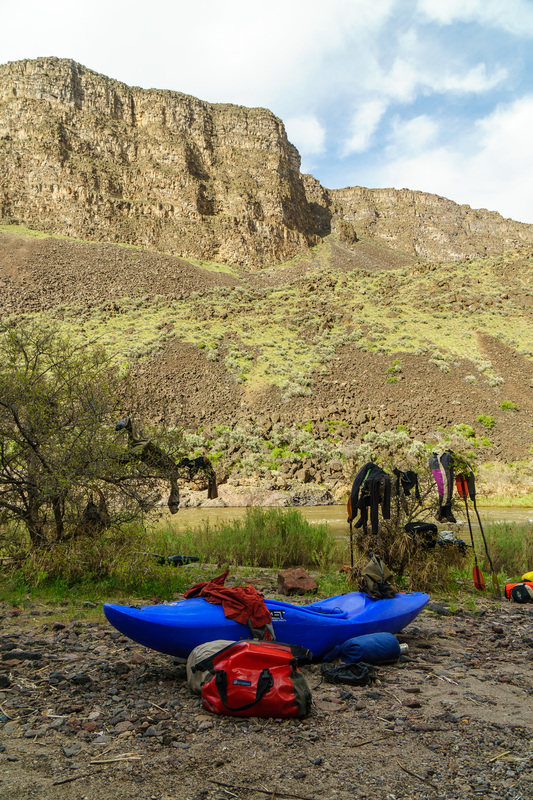 Gearsplosion at the Bombshelter Cave on the Middle Owyhee. At flows around 3000cfs, we found the river moved quite quickly and we had no trouble making miles. There is a natural cave called the “Bombshelter” at mile 16 that makes a great day one camp. The last few miles after the canyon begins to open up are quite flat, but at higher flows it didn’t feel like a slog. Lower flows would make travel a lot slower — the river is very pool-drop, so even in the canyon, the flat sections would feel very flat. There’s great camping on open sandy beaches in the first 15 miles (before the Bombshelter camp). After Bombshelter your options are more limited. Widowmaker, the largest rapid of the run, is found around mile 21. Multiple packraft trips have floated this section at 200cfs or below. If you’re a skilled packrafter confident on class III, I imagine more water would be better, but it’s floatable that low which opens the possible season way up (January to August based on typical gauge flows, though the roads may not be passable in winter).